2,024 days to go. I’m posting this blog September 23, 2018, and, yes, there are 2,024 days until the next great American total eclipse, which will occur April 8, 2024. Citizens of and visitors to the United States are still abuzz about the August 21, 2017 total solar eclipse. Videos, photos, and social media reports still abound. I hope you saw it. But maybe you missed it — at least the total part. Why doesn’t matter. Whether you were serving on a submarine at the bottom of the Pacific Ocean, just awoke in a hospital after a zombie apocalypse, or were hampered by the thickest (and darkest!) clouds anyone ever saw, you failed to experience the awesome wonder of the 2017 total solar eclipse. Now what? Well, perhaps you’ll want to plan a trip to South America for the next two such events. Or Antarctica. I urge you, however, to look carefully at April 8, 2024. And although 2,024 days from this post sounds like a lot, it’s much shorter than the average time between eclipses in a specific location (330 years in the Northern Hemisphere and 550 years for locations south of the equator). While the maximum length of totality during the April 8, 2024, eclipse won’t be that long, it’s still a worthy chunk of time: 4 minutes, 28 seconds — 67 percent longer than the one in 2017. And as with that one, everyone in the contiguous U.S. will see at least a partial eclipse. In fact, as long as you have clear skies on eclipse day, the Moon will cover at least 16.15 percent of the Sun’s brilliant surface. That minimum comes at Tatoosh Island, a tiny speck of land west of Neah Bay, Washington. And although our satellite covering any part of the Sun’s disk sounds cool, you need to aim higher. Likening a partial eclipse to a total eclipse is like comparing almost dying to dying. If you’re outside during a solar eclipse with 16 percent coverage, you won’t even notice it getting dark. And it doesn’t matter whether the partial eclipse above your location is 16, 56, or 96 percent. Only totality reveals the true celestial spectacles: the two diamond rings, the Sun’s glorious corona, 360° of sunset colors, and solar prominences (through a Hydrogen-alpha filter). To see any of these, you must be in the path of totality. That said, your next goal is to be as close to the center line as possible. The fact that the Moon’s shadow is round means that the longest eclipse occurs at its center line because that’s where you’ll experience the lunar shadow’s full width. The shadow’s path covers a few more tiny islands before it encounters North America just southeast of Mazatlán, Mexico. Hey! That city was my base of operations for the 1991 total solar eclipse. Viewers from that location will enjoy 4 minutes, 27 seconds of totality. And if you wish to stay in Mazatlán, you’ll lose only 10 seconds off that span. The greatest duration of totality — 4 minutes, 28.1 seconds — occurs when the shadow reaches San Martín, north of Torreón and roughly half the distance from the coast to the Mexican border with Texas. In fact, the duration of totality along the center line is never more than 1 second less than this maximum during the shadow’s more than 550-mile (885 kilometers) voyage through Mexico. Totality first occurs in the United States as the shadow crosses the Rio Grande River at the wonderfully named Radar Base, Texas, which lies in Maverick County. 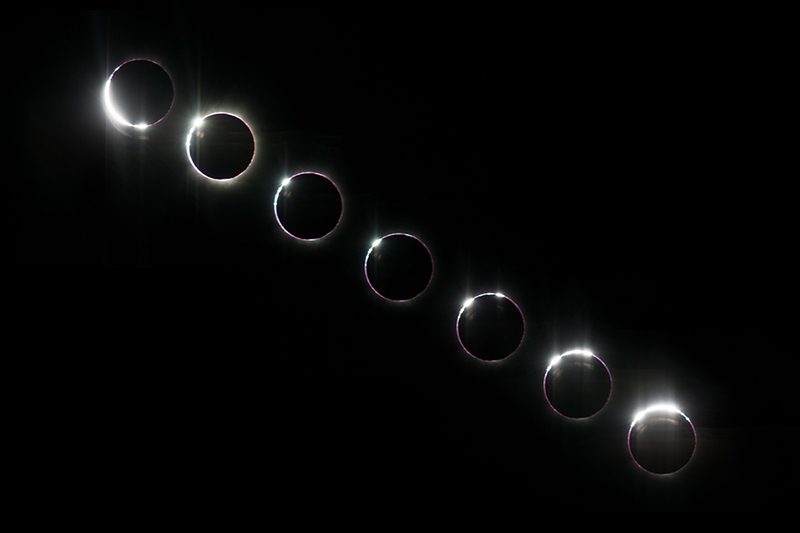 There, totality lasts 4 minutes, 27 seconds. As the eclipse progresses through the Lone Star State, a huge number of people won’t have to travel anywhere to see it. That said, just a few miles’ journey to the center line can increase their duration of totality. San Antonio, Austin, Waco (Baylor University will enjoy 4 minutes, 10 seconds of darkness), Dallas, and Fort Worth all lie under the shadow, although none is on the center line. Still, that’s more than 11 million people who can experience the total phase of the eclipse by simply walking outside. And we’re not even out of Texas yet. The center line then passes through Oklahoma, Arkansas, Missouri, Illinois, Indiana, Ohio, New York, Vermont, and Maine. Those wishing to observe the eclipse from the same location the center line crossed during the August 21, 2017, eclipse should head to a location near Makanda, Illinois, which lies just south of Carbondale. A word of warning, if I may: The weather in Illinois in April — and here I’m specifically talking about cloud cover — will be a lot different from what it was for the August 2017 event. Your chances of actually seeing the 2024 eclipse increase dramatically as you head to the southwest. Not to mention that you’ll pick up an extra 15 seconds of totality from center line locations near San Antonio. Other cities in the path include Little Rock, Arkansas; Indianapolis; Dayton and Cleveland, Ohio (with northwestern parts of Cincinnati and Columbus under the shadow); Buffalo, Rochester, and Syracuse, New York; and about half of Montréal, Québec, Canada. 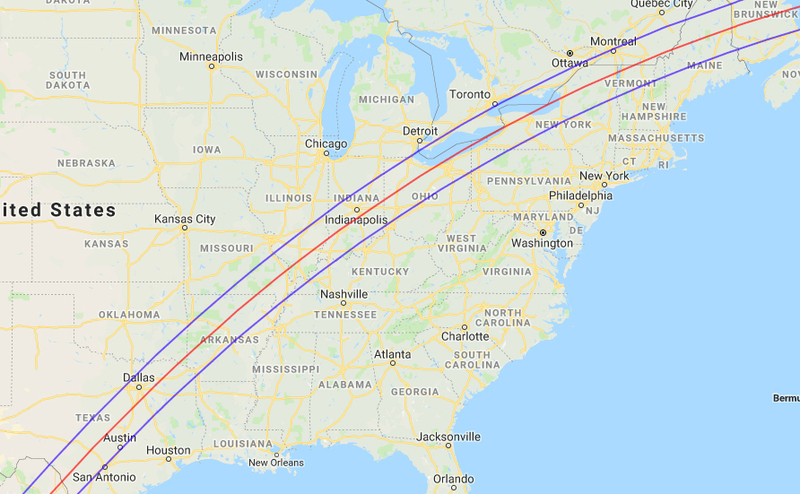 If you miss the 2024 total solar eclipse, you’ll have a 20-year wait until August 23, 2044, for the next one that touches the lower 48 states. That eclipse will be visible only in northeastern Montana and a tiny segment of North Dakota. Its greatest duration of totality, 2 minutes, 4 seconds, happens over Canada’s Northwest Territories. For those of you who stood beneath the Moon’s umbra in August 2017, no convincing is necessary to get you to darkness in 2024. It’s a sight you’ll never rate as anything other than awesome. Just be sure to check the weather first.